Nina Kashif, GM and Head of Programming Urdu1 stated "This year has been exciting for us with our consistent commitment to fashion on this platform. With the successful launch of Urdu1 Pictures, we want to take entertainment and fashion industry to newer heights. The entire Urdu1 team including myself, are very excited for the show. Watch out for some great surprises lined up for everyone." Nida Azwer, CEO, Fashion Pakistan Council, added, ““The Winter/Festive season is about fashion that is largely luxurious, opulent and of course trend setting. 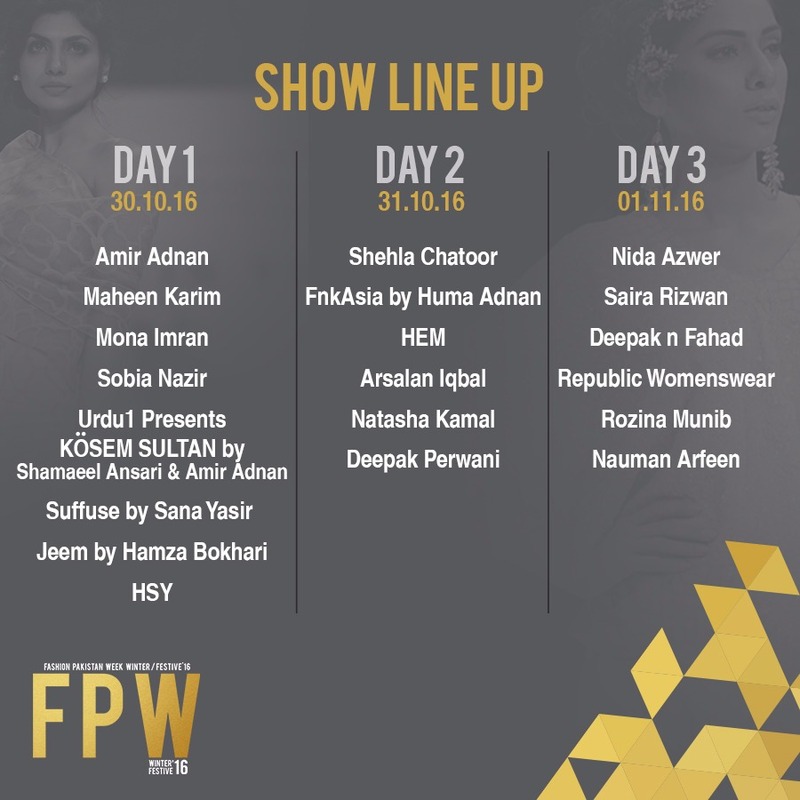 We believe that each participating designer will bring something unique to the show; from our more established designers to our upcoming, burgeoning talent, who we always promote at Fashion Pakistan and the shows that we do. The former FP board has worked hard to bring the show to where it is today; one that looks to set trends, define style and introduce new talent each season. Our new board, including myself, now looks to build on the infrastructure and create new avenues to elevate the show this season, and in the years to come." The event will be designed and managed by CKO Events Architecture, and backstage will be managed by Production 021. N-Pro (Nabila) and N-Gents will serve as the official styling partners for the event. 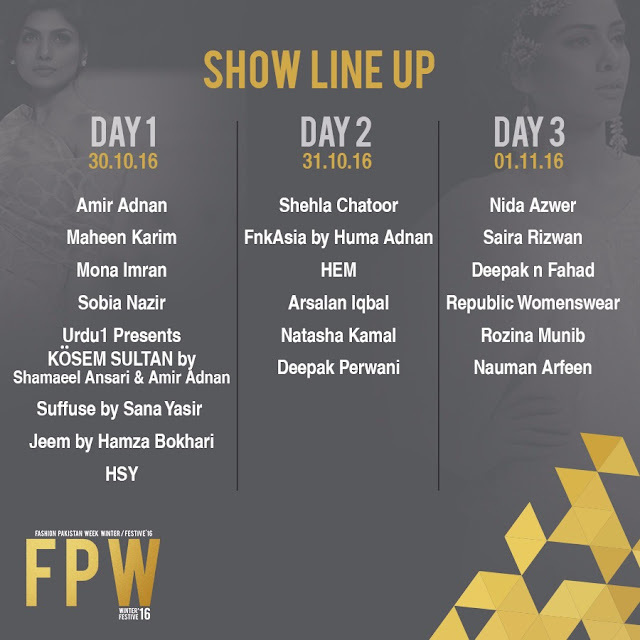 Show direction is by Fashion Pakistan Council and choreography will be by HSY. Walnut Communications is the PR Company, responsible for handling press and media and Mind Map Communications will be officially handling the Digital Media for the event. Urdu1 is the official event and media partner with TDAP being the official hospitality partner, while official beverage partner is Coca Cola. Patio is the official food partner and FM91 is the official radio partner.